Defy the laws of time and use your special abilities to fix the present. 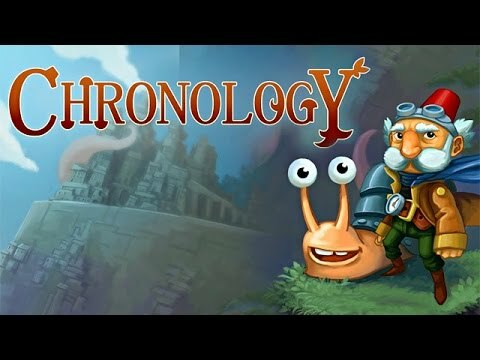 "Chronology is a clever logic game where you have the ability to play in two different times: the past and the present. You can manipulate your surroundings and interactive objects differently depending on what time you're in. You pick up a box 'now' and use it 'then'. It's great fun and just a little frustrating, because it isn't a cookie cutter hidden object game - you need to puzzle stuff through." Manipulate the past and future to fix the present in this mind-bending puzzle adventure. Explore time as the old inventor and his sidekick Snail, and take advantage of their special abilities to correct the mistakes of time. Travel back and forth, stop time, manipulate objects and solve puzzles as you switch between two lovable characters and combine their strengths. As the story unfolds, learn how the inventor has already played a central role in shaping the future of his world. Inspired by Hayao Miyazaki and his works Howl's Moving Castle and My Neighbor Totoro, Chronology features amazingly animated characters, machines and creatures that will spark your imagination.